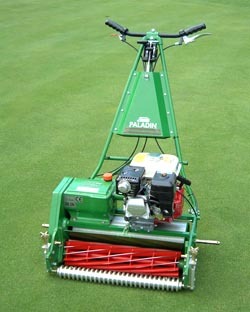 Lloyds Paladin TG has all the features and performance of the Paladin but with the added benifit of a groomer which is fitted very closely between the cutting cylinder and the grooved front roller. For turf conditioning, whilst cutting the groomer aids healthy growth by removing the lateral grasses and other debris thus further aiding the playability of the surface. The groomer can be engaged or disengaged via a simple clutch arrangement as with the conventional Paladin the cutting cylinder can be removed in five to ten minutes therfore, still retaining the ever important ease of the maintenance. A feature for which the Paladin is highly regarded.